1. Kiddiewinkles Toy Baskets are a stylish yet practical way to keep rooms tidy and clutter free, with a design for everyone. With no hard edges they are perfect to store kids items, including cuddly toys, towels, bedding and more. To make them extra special, why not personalise with a name or phrase of your choice. 2. This gorgeously glazed home takeaway set is ideal for that lazy Easter Sunday evening feast. Contains: 2 x Deep Noodle Bowl, 2 x Small Bowl, 2 x Pasta Bowl, 1 x Small Rectangular Platter. Dorco razors is the ultimate Easter gift for both men (Pace 6 Plus) and women (Eve 6) seeking the best shaving experience possible. Experts in shaving technology for over 60 years they provide six blades, a gentle nourishing strip, and handy subscription service to mend all your grooming woes. Price varies due to Dorco’s flexible subscription service which can be tailored to suit every individual’s needs – for more info visit: razorsbydorco.co.uk. 3. 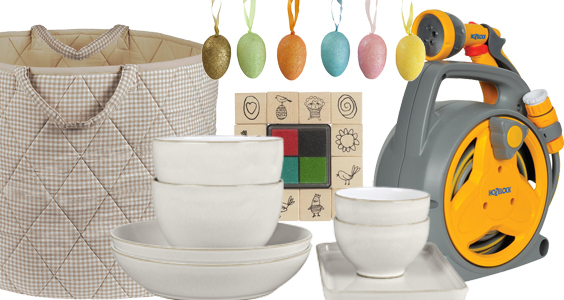 Hema have a whole host of Easter ideas from practical, to decorative, to fun – all at very good prices. The decorative eggs are £2 and the stamp set is £2.50. For more info visit hemashop.com. 4. Now that spring is in the air, use Easter to propel you into gardening mode – and not much will help more than this stylish Hozelock Pico Reel, which provides fantastic coverage for its size and is perfect for watering pots, planters or borders. 1. Lovely, shimmering BonBon Yellow Plated Stainless Steel and Pave Set White Crystal Bracelet. 2. Perricone MD’s new Cocoa Moisture Mask is a wonder product that nourishes skin and visibly improves texture. £59 from perriconemd.co.uk, Space NK, John Lewis. 3. Yellow is definitely the colour of Easter – this classic Emma Bridgewater mug will brighten up any April showers. 4. Pretty fine bone china Seymour mugs and Knot Garden Seymour Tea Towels. Mugs £12 each, tea towels £9 each from tudortimes.co.uk. From wooden ornaments to designer necklaces, sustainable lifestyle brand, Banbayu.com has your Easter decorations covered with their range of handmade cushions. Explore Banbayu’s full collection of cushions online to find your favourite style. 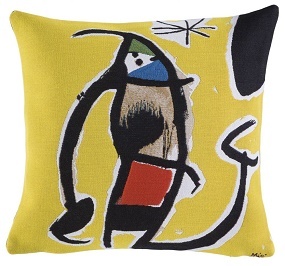 We recommend their Joan Miró designs for a spring feel, including this colourful Femme Oiseau Etoile cushion. 1. Here’s the classic car racing game rebooted. All operated through a smartphone or tablet, Anki OVERDRIVE is battle-racing at its best where players control physical supercars via handheld mobile devices to compete against friends, family or AI commanders. 2. For 7+ years, Googly Eyes is a drawing and guessing game while wearing a pair of vision altering specs. As much fun as that sounds! £19.99 – more info from university-games.co.uk. 1. This Out To Impress bunny is a craft set with everything you need to make a cuddly soft toy. Use the thread and stuffing and bring your bunny to life. Ideal for ages five and up. Good price too. 2. An addictive game for word lovers, Word Has It adds an electronic timer and category cards to a ‘build the longest word’ concept. 3. For ages 4+, Yeti in My Spaghetti plays on the classic Jack Straws idea. 4. Fast-paced shouting out game where you have to name three simple things (for example, ice cream flavours) in just 5 seconds. Harder than it sounds! 1. Ferrero Rocher all chocolate tree with a personalised message on the jar. 2. Two items at a good price from Aldi – a hollow popping candy Easter egg aand a large Dairyfine chocolate bunny. £2.99 and £3.99 from Aldi. 3. Two very special luxury items from Chococo. 43% Venezuelan origin milk chocolate egg with marbled outside and actually studded with ammonites on the inside. Luscious Sea Salt and Caramel Egg with mini pods of caramel inside. 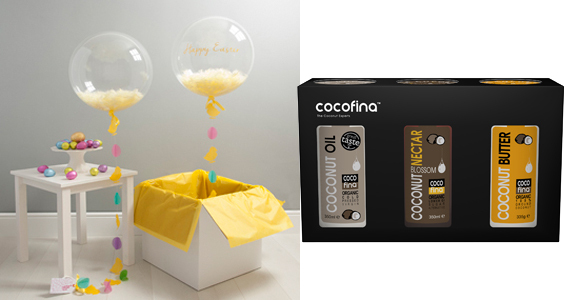 £10.95 for dinosaur egg, £16.95 for Sea salt and Caramel – from chococo.co.uk. 1. Beautifully indulgent handmade Champagne truffle eggs with gold leaf. 2. Carluccio’s little rabbit characters come in white, dark and milk chocolate. 3. Fabulous collection of artisan choc gifts from Choconchoc. £9.99 for boxes of 9 from choconchoc.co.uk. 4. Very entertaining ‘Make Your Own Chocolate Pizza’ kit with jelly beans, rainbow drops and dark and white choc. Yummy. 1. Mason’s Dry Yorkshire gin comes in a tea infused version. £35.99 – more info from masonsyorkshiregin.com. 2. Ultimate high impact run bra for activity seekers. £42 from John Lewis and Debenhams. 3. Just to prove we’re not total heathens, this Revelations of Divine Love book by Julian of Norwich is exquisitely bound and beautifully crafted by The Folio Society. 1. This sweet helium filled balloon adds a touch of chic (or should that be chick) to Easter as it’s filled with yellow feathers and a sweet Easter-themed tail. Can be personalised with a message. From £30.60 from Bubble Gum Balloons. 2. A trio of organic products using the ingredient du jour: coconut. The oil, nectar and butter have multiple uses and are much more healthy than sugar or traditional butter. If you know someone who decided to kick their unhealthy smoking habit for Lent, you may want to invest in a healthier alternative for them to suppress their nicotine urges and continue with a smoke-free lifestyle. By using a vaping kit you can enjoy the sweet treats Easter has to offer. This liquid version of your favourite Easter treat from Element provides an array of smooth chocolate notes accompanied by tobacco flavouring to give you that indulgent earthy taste you can enjoy without inhalation. One Comment on "Easter Gift Guide 2017"